Battles in Destiny's PVP arenas will soon be more rewarding, and more varied. 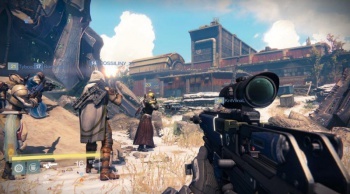 When it comes to PVP, Destiny's "Crucible" arenas are not exactly enticing. The game offers far more varied and rewarding PVE scenarios, that its PVP content has fallen to the wayside. Bungie realizes this, and is aiming to completely overhaul the system in the near future. IGN had the opportunity to sit down with Bungie's Lars Bakken the Crucible Design Lead and Derek Carroll the Senior Crucible Designer who have been hard at work bringing a lot of much sought after improvements to multiplayer. Firstly, Bungie is doubling the amount of marks and reputation players will earn in any of the Crucible's modes. When you win you'll receive six marks instead of three and twice the amount of experience per match. It is also planning on hugely diversifying the loot pool of the PVP mode, stating "We've doubled that stream period so you're going to see a lot more blues dropping at the end. On top of that we've added purple. I believe there are 12 new legendaries that will drop." On top of this, Bungie confirmed that players will be able to earn Etheric light - a new item that allows you to upgrade pieces of gear to max level - in the crucible. Bungie explained that you'll receive one from hitting level 3 in Iron Banner, one for hitting level 5 in Iron Banner, as random drops in Trials of Osiris, and as a supplemental drop in Nightfall missions. In addition to the loot changes, "It'll be less likely that number 1 doesn't get anything," Bungie said, referring to the fact that players who place "first" in a PVP game can sometimes walk away empty-handed.